How do we calculate the rotation to look at a particular point? First take the simpler 2D case. We are at Peye and we are currently looking at Pcurrent what angle do we have to turn to look at Ptarget? 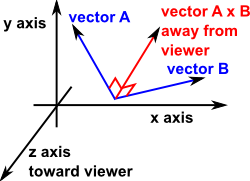 The axis of rotation is a vector which is mutually perpendicular to both Pcurrent and Ptarget which is given by the cross product of these normalised vectors. 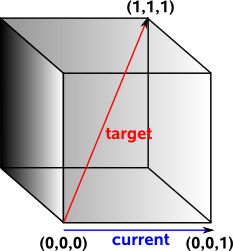 The angle is given by arccos of the dot product as described here. 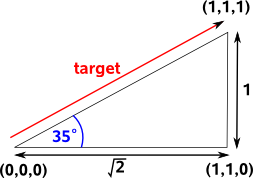 In order to calculate the angle around Ntarget I think we have to project yaxis and up onto a plane perpendicular to Ntarget. To do that we calculate the projection matrix which is [I] - Ntarget Ntargett This is proved here. The value of 'up' can be a bit arbitrary in some cases, for example, imagine that we want to aim a telescope to look at a given star in the sky: we may only be concerned about getting the star in the centre of the telescope and less concerned about how the other stars are rotated around it. In other words, we may not be concerned about the component of the rotation around the axis between the observer and the target (see box on right for a discussion of the distinction between 'orientation' and 'direction'). Since the direction of the 'up' vector is not important we often use an arbitrary value like (0,1,0) although this is questioned in this thread - here is a quote from it: "Using a constant vector such as (0,1,0), which is the only recommendation I've ran across is no good. You end up rotating the bank axis for no reason, and near singularity points (attitude +-90) the camera spins wildly. My solution was using [currentRotationMatrix * (0,1,0)] as the up vector. It makes sure only the heading and attitude are changed for the lookAt so the bank is not altered, and it has stood up very well through testing. I highly suggest you mention it on the lookAt page." Imaging you are in a cuboid room, you on the floor of one corner looking along along the base of one wall, you want to turn to look at the top of the opposite corner. What angle do you have to turn through? Most people would say that you would need to turn through a heading of 45° and then rotate up at an attitude of 45°. This belief is so strong that programmers will spend days rewriting and debugging their code if they don't get this answer. In fact we need to turn through a heading of 45° and then rotate up at an attitude of 35°. You turn through 45° and you are now looking at the base of the diagonal corner. You now want to look up to the top of the diagonal side. This forms a triangle where the adjacent side is √2 and the opposite side is 1. So the angle is arctan(0.7071)=35°. The fallacy here has more to do with the unintuative nature of euler angles than problems with the lookat method but this is a warning not to trust intuition when working with 3D angles and avoid using euler angles whenever possible. The components of the vectors of the rotated frame with respect to the un-rotated frame directly give you the rows of the rotation matrix. So the vector Ntarget is one of the three rows of the rotation matrix. To get the second row, you must specify another property of the orientation by specifying the direction, perpendicular to the forward direction, in which the "up" axis of the object must point. The third row is the cross product of the other two. Can we derive this method from the first method? that eye is at the origin. what we need to do is to get the matrix for this rotation, I have been trying to calculate the matrix which gives the rotation between two vectors here but it is getting too complicated can anyone help here? again this is getting complicated ! Once we work out these two matricies we need to multiply them to give the the total rotation matrix. An axis angle version is not so easy as we need to combine two different rotations. So here we will return a quaternion as its easier to combine rotaions using quaternions. A 3D vector can be used to define a direction. If a vector is used to define direction in this way then the length of the vector is not relevant, therefore we can use a unit length vector. Note that direction is different from rotation (or orientation) in that direction just tells us which direction an object is in but rotation also includes revolving around the vector. So direction would be enough to locate a given star in the night sky but rotation will orient it so the constalations are seen a certain way round. For the rotation required to look in a given direction see this page.